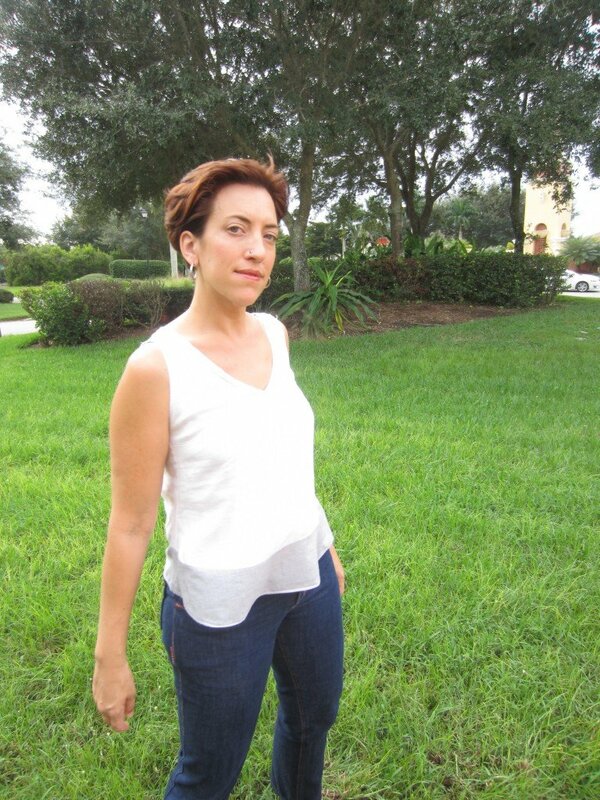 I’m back today with this simple Linen Swing Top made using my Sloper and refashioned from two less than successful makes. The grey stripe voile (given to me by Organic Cottons Plus for review when I made it originally) is from my Bias Layer Dress. The fit of the grey dress was a bit off in comparison to my blue version. The dress was just too boxy and the shorter length looked dull. I remade it into another top with the same fabric which I’ll show you next week. So stay tuned! The white linen is from a slip I made a few months ago to wear with my Holly Hawthorn Dress. The pattern was free so I gave it a go but It never fit well. But that’s the beauty of sewing for yourself. If at first you don’t succeed try, try again! I used the white linen for the bodice and the grey and white stripe voile for the trim. This was a really simple pattern to adapt from my sloper. I altered it to a v-neck and simply angled out the sides at the underarm for the flare. I then added a 4 ” border from the waist for contrast. All the edges are bound with bias on the interior in the grey stripe voile which makes for a pretty interior. I’ll fix a few things next time around. It’s a bit tight across the chest right now as you can see from the wrinkles. To fix that I’ll raise the shoulder 1/2″ and lower my armscythe. I’m pretty sure that will do the trick. I love the shape as this top moves. It really flows wonderfully. A simple classic look. I need more tops like this in my wardrobe. It goes with everything! Worn again with my favorite embroidered jeans. I have a backlog of sewing projects that’ll be sharing in the next few weeks. But for the next month (and for the past two weeks!!) I’ll be working on Christmas gifts. No sewing for myself until the new year. And I have the most gorgeous Liberty silk floral that I’m waiting to make into a Granville Blouse! For Christmas Gifts with the kids we do: Something you WANT, Something you NEED, Something to WEAR (handmade of course!) and Something to READ. So right now I’m working on making the kids some adorable knit jackets. Nigel is getting a blue fleece hoodie with a skateboarder print as accents and Ami is getting a peplum jacket with hearts and knitting bunnies, plus a matching dress with the extra yardage…it is SO freaking cute!!!!! You can check out the patterns and prints I’m using on my Christmas Gift Pinterest Board. I’m also making up a ton of Grainline and Fringe Supply’s new release,the Stowe bag, for my extended family. I’m sewing like crazy! This top looks ethereal. The gray fabric at the bottom gives the illusion that it is see-through and whispy.